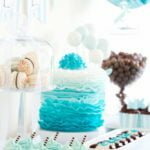 Baby showers would not be complete without gorgeous and delicious cakes and cupcakes for the guests to enjoy while celebrating with the guest of honor. In fact, it is not unusual in a lot of baby showers for planners or hosts to opt to serve just light snacks (sandwiches, appetizers) and load up on the desserts instead (pies, cakes, fruit platters, cupcakes) especially for those showers that are packed with various activities and not really a lot of time for the participants to sit down for a full meal. If you’re planning the baby shower, keep in mind that it’s perfectly okay to go overboard with the baked desserts, especially if the expectant mother has a sweet tooth and loves those cakes and cupcakes. One very popular idea is to have a dessert table (or dessert tables) where various desserts are laid out buffet-style for the guests to eat to their hearts’ content. If your baby shower is scheduled at a very in-between hour and you’re not sure whether to serve lunch or dinner (if you’re serving a full meal at all), going for a full-blast cake galore not only makes it easier on your part, but it is also more cost-efficient generally speaking. Creatively-decorated cakes and cupcakes can brighten up the baby shower venue and even reinforce the theme or ambiance you want to achieve. For instance, if you have a circus baby shower theme, cakes that look like gumball machines, arcades, or stuffed toys complement the look. 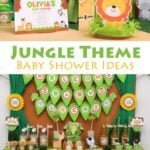 For jungle-themed baby showers, cupcakes with zebra stripes or leopard stripes complete the ambiance. Color-coordinated cupcakes and cakes for baby boys and girls are also a popular option. Baby Blocks Cake – This cake idea goes well with both baby boys and baby girls. All you need is store-bought pound cake, assorted colored fruit chews, and food coloring, aside from the frosting. Lollipop Cupcakes – These cupcakes are very cute and can be decorated all over your baby shower venue. The lollipop colors can go with the theme or color motif of the baby shower. Flower Bouquet Cake – A cake that looks like a welcoming bouquet of flowers but looks very appetizing. The bright petals are made of marshmallow halves (yum!). You can use this cake as a table centerpiece if the baby shower is a more formal sit-down dinner. American Beauty Cupcakes – Great as desserts and also take-home party favors for your guests. These cupcakes feature a different-colored rose for each, and very easy to make yourself. Baby Bottle Cake – What could be a more perfect baby shower cake? For this cake, you will need a 9” x 13” cake and lots of colored frosting. 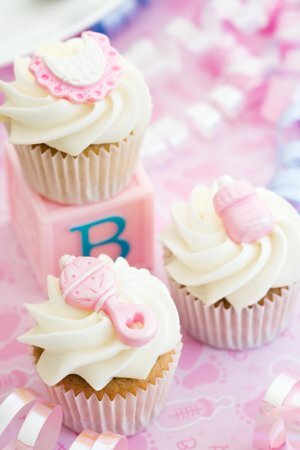 Want more information about Baby Shower Cakes, Cupcakes, and Menu planning? 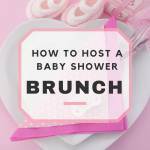 Check out Baby Shower Menu Planning: Baby Shower Food Ideas.